In a quintessentially Australian fit of inventiveness, the Beer Can Regatta stands alone as a beacon for the most insane – yet highly practical – outback festival. Each July, imaginative Territorians race boats made of nothing but beer cans along the shores of Darwin’s Mindil Beach, with nothing in mind but fun and fundraising. 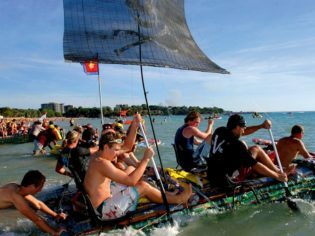 And there are loads of activities besides the boat race: if your craft isn’t seaworthy, you can take part in the Henley on Mindil race, where all buoyantly challenged boats are raced by foot up the beach. Thong (the kind you wear on your feet) throwing comps, sandcastle comps, hole-in-one comps and soft drink can regattas for kids are just some of the other activities. It’s all held in conjunction with the renowned Mindil Beach Sunset Markets, where the array of food is unrivalled across Australia. It’s a fabulous festival day, Territorian style. Mindil Beach, around 1.5km north of the Darwin town centre. The Beer Can Regatta was established in 1975, after the thousands of workmen flocking to Darwin to rebuild in the wake of Cyclone Tracy caused a bit of a litter problem. Being ever the pragmatists, a local Territorian established the regatta as a fun way to clean up the mess.